German physician and hygienist; born in Berlin Sept. 30, 1868; educated at the gymnasium in Berlin and the universities of Berlin and Freiburg (M.D. 1891). He settled in his native city, and from 1892 to 1894 was assistant physician at the Jewish hospital there. 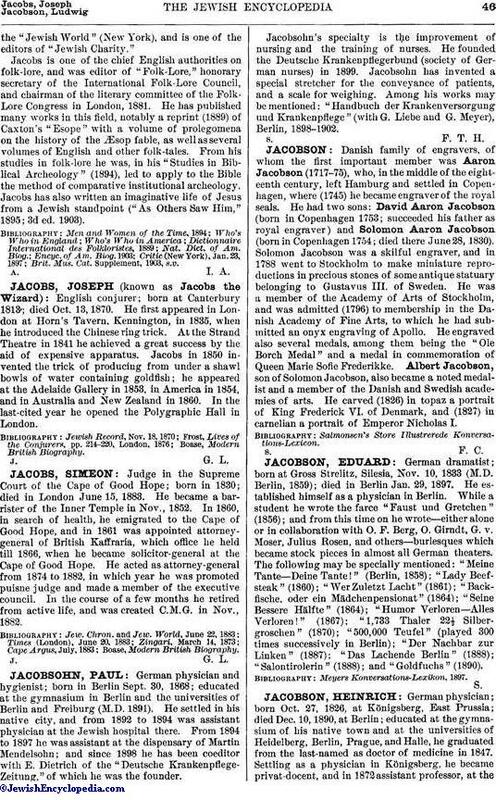 From 1894 to 1897 he was assistant at the dispensary of Martin Mendelsohn; and since 1898 he has been coeditor with E. Dietrich of the "Deutsche Krankenpflege-Zeitung," of which he was the founder. Jacobsohn's specialty is the improvement of nursing and the training of nurses. He founded the Deutsche Krankenpflegerbund (society of German nurses) in 1899. Jacobsohn has invented a special stretcher for the conveyance of patients, and a scale for weighing. Among his works may be mentioned: "Handbuch der Krankenversorgung und Krankenpflege" (with G. Liebe and G. Meyer), Berlin, 1898-1902.